Morzine - Montriond, Portes du Soleil, France: bed & breakfast or catered, sleeps 1/14 We have carefully chosen our chalet to meet up with all the requirements for a perfect ski holiday. 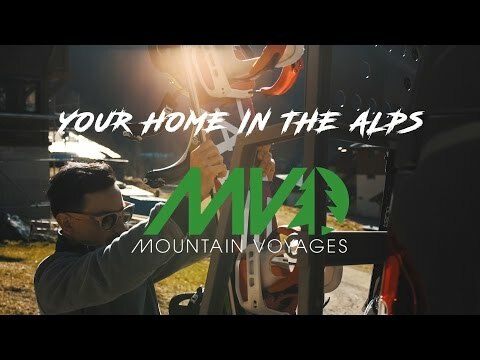 Welcome to Mountain Voyages, the chalet experience unlike any other. We are Leo and Lian, a young couple with passion for the mountains, exceptional food and even better service. You have us as your hosts!! We pride ourselves on going that extra mile so all you have to do is relax and enjoy the whole mountain experience! Mouth watering meals. We know how important it is to have amazing food on holiday, specially after an active ski day! We are situated in the heart of Portes du Soleil, Morzine, the biggest ski area in Europe. Private mini bus lifts to and from the slopes, meaning no walking in uncomfortable ski boots. South facing outdoor hot tub with amazing views of the valley to relax in after a hard day's skiing. Chalet Voyages has a nice spacious feel and the Open plan living space means there is plenty of room for everyone to relax…whether you prefer a vin chaud by the fire, a glass of red chatting over the dinner table or just want to relax in the Hot tub with an ice cold beer, you’ll find Chalet Voyages créâtes the perfect atmosphere for your Holiday..
We are just a few minutes to the gondola at Avoriaz which gives you access to Avoriaz, switzerland and Super Morzine and if you want to ski in Morzine/ Les Gets then the Pleney lift is a short drive away also. Early bird gets always the best of the best! We are going to our 4th successful winter with around of 70% of repeat guests and a certificate of excellence from TripAvisor for each year since we opened our business. We put a lot of love and effort into our business reflecting a complete satisfaction with our accommodation, food and service. So why not contact us now and get this sorted? We will be happy to help at any time. Continental and cooked* breakfast every morning. Afternoon tea with freshy baked cakes, hot chocolate and vin Chaude. 4 course evening gourmet meals 6 of 7 nights a week. * Cooked breakfast 6 of 7 days a week. We have our own personal minibus transfers to and from the lifts. We can organise ski passes and ski/board hire so that it's waiting at the chalet on your arrival. We can organise transfers to and from the airport. Geneva airport is only a 1h 15mins drive to the chalet.